I first saw a recipe for Polenta Soup while scrolling through my facebook newsfeed a couple of months ago. But I can’t really call this a vegan version of that, or any other one I saw, because I kind of just did my own thing. I wanted a low fat soup that was somewhat reminiscent of chicken noodle soup–without the chicken and without the noodles–but with all the comfort of that nourishing good-for-the-soul sort of meal. 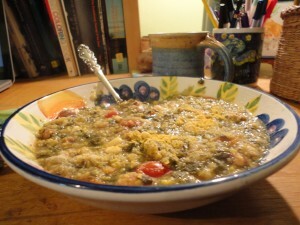 Most of the recipes I saw relied heavily on butter, olive oil, cheese and/or cream to make a thick kind of creamy soup. Since I like plain soft polenta so much, I just decided to make polenta, but with extra broth and seasonings and a few other things thrown in, and stop cooking it when the polenta was soft but there was still enough broth to create a thick soup. You can put just about anything you want in this soup. I’ve made it twice and I’ll give you all the options I used in each version. Except one. I almost put a julienned parsnip in the second time I made it, which was at the beginning of this week. I realize parsnips can be an acquired taste–I had never tasted one until I started shopping at our Farmer’s Market–but I fell in love with them. I thought their mild starchy taste would go great with the poultry seasoning and the carrots and other veggie goodies in the soup. But then I looked at the parsnip. It was beautiful. The much missed sun was finally streaming through the windows in all it’s brief, late-winter midday glory. Instead of slicing up the parsnip, I put it down a a white sheet of paper on the dining room table and started to draw it. When I draw, I forget about everything else, even eating and cooking, so I had to keep pinching myself to get up to stir the polenta soup. By some miracle I did not burn it AND I got a drawing of the parsnip I was happy with. So even though the parsnip did not make it into the soup this time, it made it onto the page. . .which is also a lovely happy thing. I’m glad it got away, at least that time. This is actually more of a strategy than a recipe. The first time I had Everything But the Kitchen Sink Broth made. I used carrots, celery and frozen corn, along with the frozen spinach. The second time I didn’t have broth made, so I used leftover cooking water from corn pasta and cabbage, and bean broth. I didn’t have corn or celery so I added grape tomatoes and dried mushrooms. I didn’t have chickpeas cooked, so I used Anasazi beans, which turn a lovely pink color when they cook. The variations are endless The most important thing is to cook the polenta in more liquid than it can absorb and voila! You have polenta soup. Moisten your polenta with the 2 tbs of water in a small bowl. In a soup pot, saute the onion, celery and carrot (and red pepper if you use it) in a little broth or water. Start with about 2 tbs and add a little more as needed to prevent sticking. When the onion is softened, after about 5 minutes, add whatever spices you like, the tomatoes if using, and stir. Add the broth and bring to a boil. Stir in the polenta. Stir in the quinoa. Keep it at medium heat while the grains cook and stir often. When the grains are done, about 10-15 minutes later–I taste to be sure–add some frozen spinach and frozen corn, if using, and the cooked beans. Taste and add more seasonings or nutritional yeast if desired. Serve topped with a few pine nuts and some sliced green onion or extra garlic granules and/or nutritional yeast sprinkled on. You can add or subtract from the suggested list of veggies and seasonings according to your taste and what you have on hand. You can also add steamed veggies to leftovers, extra garlic, more parsley. 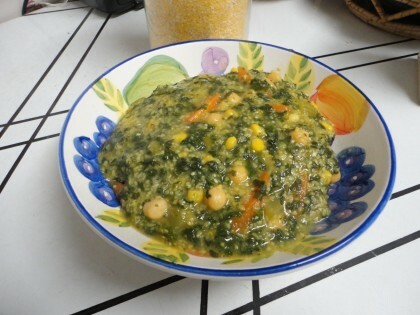 My absolute basics are the broth or cooking liquid, the polenta, onion, garlic, poultry seasoning, beans, spinach and lemon. If you can’t eat corn, you could try this with just quinoa. If so, you might want to add some sweet potato, to substitute for the sweetness of the corn. Maybe make it more spicy and/or Southwest-y with some chiles or chili powder. I’m so much more interested in cooking this way than I used to be. I used to be afraid to cook without a recipe, and now I’m making things up sometimes. It’s really fun, isn’t it? Hi, what is in poultry seasoning? I only use vegetable bouillon, will that do? Hi Shona, and welcome! The poultry seasoning I get comes from Frontier and has the following spices in it: Organic Sage, Organic Thyme, Organic Onion, Organic Black Pepper, Organic Marjoram, Organic Celery Seed, Organic Cayenne. These are spices traditionally used to cook poultry, but you can use them for anything else you want, too. I imagine your vegetable bouillon has some of these same spices, so it would probably work fine. The thing I like about this particular poultry seasoning mix is that it’s salt free. Welcome. Shawn, and thank you so much for this vote of confidence about the recipes and the artwork!! I totally agree with Pam about the strategy-over-recipe style of cooking. I have The Joy Of Cooking and used to use it regularly, following every direction to the letter. Things came out great of course! This makes cooking now a truly creative endeavor, so much more engaging than following a recipe, and so much more appreciated when things turn out tasty. Like you said, if you cannot use corn, try quinoa with a bit of sweet potato for the sweetness. Brilliant! Love the parsnip. I am beyond impressed that no burning happened whilst you drew. I have ruined many a pot…. Maria, this looks delicious! I never thought of using polenta in a soup, but I bet it makes it creamy and delicious. 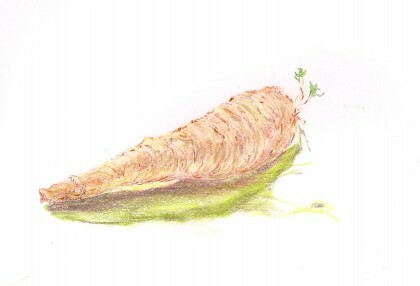 Also, I’m so very glad the parsnip didn’t end up being cooked–what a beautiful drawing! Thanks Lee! It IS a nice (and easy) way to get a creamy soup without high fat. And so happy you found the parsnip beautiful! Next post: Is “Significant Benefit” Enough?